TCW240B is a data acquisition module, designed to work in Ethernet based networks. 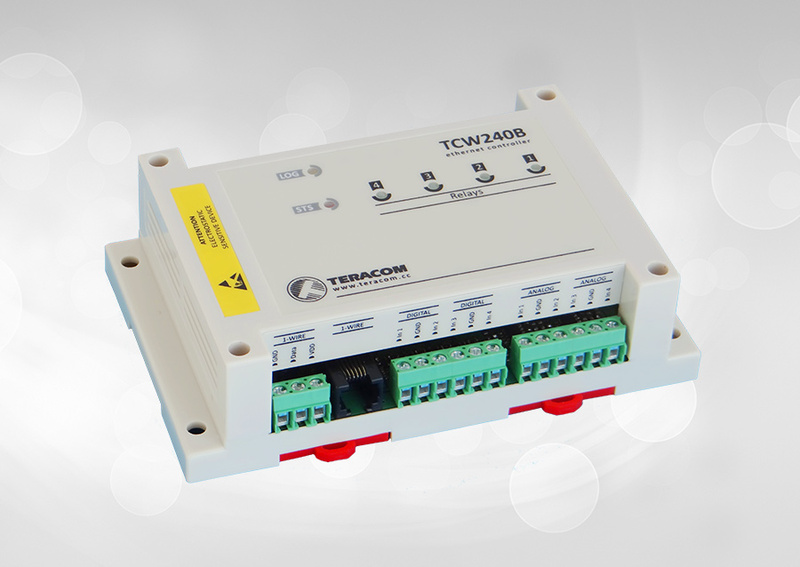 It includes 4 digital inputs, 4 analog inputs, 1-Wire interface for up to 8 Teracom 1-Wire sensors like temperature, humidity, CO2, current, 4/20mA, galvanic isolated analog voltage etc. It also has 4 relays with normally open and normally close contacts. The relays can be activated either remotely (WEB, SNMP, HTTP etc.) or locally – from status of monitored parameter (1-Wire sensor, analog voltage and dry contact). Only one parameter can control the relay at the same time, but for every parameter can be sent e-mail/SNMP trap for alert conditions. Embedded real time clock gives a possibility to arrange scheduled task in time. The tasks can be either single or with weekly repetition.